Bengaluru: Cognizant Technology Solutions Corp. expects its rising share of revenue from digital technologies to help boost profitability from 2019, an important marker as the Nasdaq-listed firm becomes the first information technology (IT) outsourcing company to put a timeline to when it expects benefits from its investments in newer technologies. Until now, all IT firms, including Tata Consultancy Services Ltd, Infosys Ltd and Wipro Ltd, have assured investors and analysts of the promised benefits of embracing “digital", the fuzzy umbrella term which each company uses to classify revenue generated from areas generally classified as social, mobile, analytics, cloud computing and Internet of Things. But for stakeholders of these companies, digital is still a black box, as none of the companies have quantified or shared a timeline by when the promised benefits (both in higher growth and improved profitability) will start reflecting. “Digital for us is not just (building for a client) a web interface," said Rajeev Mehta, president, Cognizant. “We have focused a lot on margins, and we are getting it at 21% (non-GAAP) this year. “(Until now), a lot of our work has been in optimizing our supply chain pyramid structure. Those are the operational components. Now the bigger component is digital. As we look into 2019 and as we look to improve our operating margin to 22% (non-GAAP), I believe that digital will be a big driver because that digital portion of business comes at a higher margin for us," said Mehta. Cognizant claims that digital accounted for $1.13 billion or 28.9% of its revenue in the January-March period. 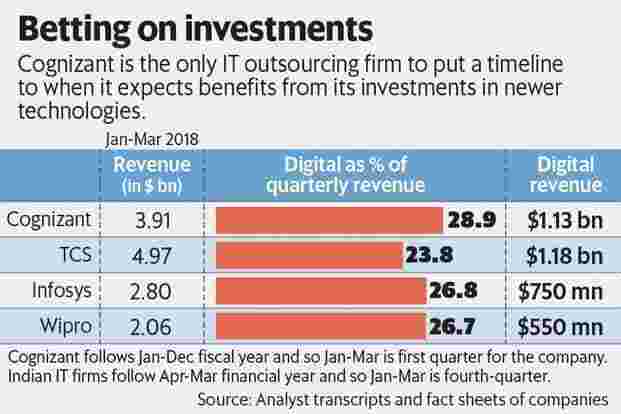 In absolute terms, Cognizant’s share of digital is almost on a par with India’s largest IT services firm, TCS, which claims that digital totalled $1.18 billion or 23.8% of its $4.97 billion revenue in the January-March quarter. Significantly, Cognizant’s commentary on digital is in contrast to the performance of TCS, Infosys and Wipro, which despite claiming a faster growth in new business offerings, have struggled for growth even as their profits have taken a hit over the last 12 months. A case in point is Infosys: Despite surprising analysts by disclosing for the first time in April that digital accounted for 26.8% of its revenue in the January-March period, Infosys has outlined a lower profit outlook of 22-24% for the current financial year. Hearteningly for investors of Cognizant, the Teaneck, New Jersey-based firm is the only company which has managed to improve its operating margin from 18.9% (non-GAAP) at the end of March last year to 20.3% (non-GAAP) during the January-March period. This translates into GAAP operating margins of 17.7%, which is lower than both TCS and Infosys, which have an operating margin of 25.4% and 24.3%, respectively, at the end of the fourth quarter of last year. For this reason, many analysts remain circumspect on the promised benefits of digital from the Indian IT firms. Still, a few analysts remain sceptical on Cognizant’s ability to improve its margins. “We continue to believe that CTSH (Cognizant) will have a benefit from the rupee, including hedges and translation adjustments…We believe that one of the key issues longer-term will be CTSH’s (Cognizant’s) ability to realize higher margins on digital initiatives, and thus grow margins. With that said, we remain dubious of CTSH’s ability to reach 22% medium-term operating margins by CY19," Keith Bachman, an analyst with BMO Capital Markets, wrote in a note dated 7 May.